Why Can't Video Games Make You Remember The Dead? 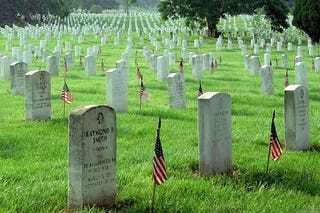 Memorial Day is a day of remembrance for Americans, where a nation pauses to solemnly pay tribute to its war dead. It's something video games could do a little more often. Most games don't just feature violence, they feature killing. It's encouraged, often in a militaristic setting. And after decades of advances in design and technology, games are getting really, really good at it. Bullets can now be individually modelled, their impact on flesh and bone able to be accurately replicated. What happens after the kill, though, they're not so good at. Memorial Day - and countless other days like it across the world, from Remembrance Day to ANZAC Day - are about paying tribute to the fallen. Yes, they can be hijacked for other means, on both ends of the political spectrum, but at their cores, they're about remembering those who died in the line of duty, and acknowledging their sacrifice. As such, they're also about remorse. Regret. A dull, aching feeling in the pit of your stomach. Those who have lived through a battle know what it's like to see someone killed in action. Those who have not can only try and imagine what it's like to give up everything - literally everything - in the line of duty. It's as integral a part of war as the killing. Yet how many games have you ever played that treat death as anything more than a hindrance or a multiplier? Where loss is as important a part of the experience as pulling the trigger? I don't mean in terms of story-telling. It's easy to kill someone in a script, whether you simply witness the death or are forced to bring it about as a boss battle or story event. No, I mean in terms of playing through a game and, through your actions, forming a bond, developed through dependency, with an in-game character. They help you out, you help them out, you grow in experience and ability together, and then suddenly, because of something that just happened, they're dead. X-Com is one of the few titles to have done this, with the ability to name your squad mates and take them into battle with you. The Rainbow Six series is another, as is Wing Commander. These games allowed you to carry squadmates through from one battle to the next, and as they did, they'd get better. Work better with you. You'd get to know them better. Just like real comrades in a real war. What made it real, though, was the fact they could die. One stray bullet, whether by accident or some careless command from you, the player, and they were dead. And not video game dead, where you could magically revive them, or they'd be "unconscious" and would return for the next mission. Actually dead. They'd be stricken from the game, their progress lost, and to replace them, you'd need to get a fresh young soldier and do it all again. To lose a player like that is heart-breaking. And because of that, you remember it. You remember the characters you liked most, the ones who helped you out in the most important missions. And each time you enter a new battle, those old characters are still with you, their loss serving as an example, making you more aware, more cautious of what's around each corner. It's trivial compared to actual loss, of course, and I want to make that doubly clear: the loss of a virtual squadmate is incomparable to the loss of a real squadmate in a real war. It would be insulting to insinuate otherwise. As games seem so intent on conjuring all kinds of other emotions, from excitement to humour to fear, it'd be nice if they could look past the act of pulling a trigger and deal with some less pleasant, but no less important emotions as well. Like remorse. Regret. And remembrance.